The first public beta of Coq/PIDE was released by Carst Tankink just a few days ago. See also the announcement on the coq-club mailing list from 26-Nov-2014. Building it manually from individual parts was a bit tricky, but knowing in theory how things should fit together, I managed after two failed attempts. Note that COQBIN really needs an extra slash at the end, or the Makefile will break down. There is an important conceptual difference to Isabelle/jEdit, which edits a whole project (or “session”) with many files active at the same time within the same prover process. In contrast, Coq has capitalized separate compilation a long time ago, so it is likely that its one-to-one relation of files versus sessions (with a separate coqtop for each) will remain in years to come. Update 02-Feb-2015: Carst Tankink has just announced the second public beta Coq/jEdit 0.2.0 for Coq 8.5beta1. A full-day tutorial on Isabelle is scheduled as associated event of the 25th International Conference on Automated Deduction (CADE-25), which will take place in Berlin at the start of August 2015. More than 25 years ago, Isabelle was initiated by Larry Paulson as a logical framework for rapid prototyping of Natural-Deduction proof systems. Today, Isabelle is one of the major platforms for Interactive Theorem Proving (ITP), with notable support for automated reasoning tools (ATPs and SMTs). Isabelle/HOL is the main environment for applications; it is accompanied by the Archive of Formal Proofs (AFP) as repository for user-contributions. Isabelle supports logical tool development in Isabelle/ML and Isabelle/Scala, but it is also possible to connect external tools; this works routinely on Linux, Windows, and Mac OS X. The system presents itself to the end-user by an advanced Prover IDE: Isabelle/jEdit. The purpose of the tutorial is to help participants to get acquainted with Isabelle: topics will cover specifications in HOL, proofs in Isar, use of automated provers via Sledgehammer etc. The target audience are doctoral students or researchers with an interest in formalized reasoning, application of reasoning tools for interactive and automated proof development, maybe even with an interest to develop their own tools with/for Isabelle. There will be presentations by myself and one or two colleagues, with hands-on tutoring and exercises done by the participants on their own computers (with at least 2 cores and 4 GB memory). Further organizational details will emerge sooner or later, as summer 2015 approaches. Watch this space, as well as the main CADE-25 website. The Conferences on Intelligent Computer Mathematics (CICM) — with the distinctive sub-conferences Calculemus, DML, MKM — may be seen as a gathering of fringe groups, but a very interesting one. Traditionally, it may serve as a forum for experimentation and unorthodox contributions that are difficult to publish elsewhere. I have served several times on the PC of Calculemus or MKM, and once as PC chair of MKM. For CICM 2015, I am PC member for Calculemus. Don’t be confused by the website that is somewhat difficult to navigate! Don’t miss the start of the submission process: 16-Feb-2015 for abstracts, followed by actual papers, followed the rebuttal phase. The latter is particularly important to readjust the initial verdict by the reviewers, going upwards or downwards, depending on careful reactions of the authors to what was said about their papers. For archival purposes, here are some past Isabelle tutorials from my old website at LRI (which will be discontinued eventually). Born 28-Mar-1928 (Berlin, Germany), died 13-Nov-2014 (Saint-Lizier, France). In my own studies, I have occasionally encountered the famous name of Grothendieck in lectures about functional analysis and logic. From a bit later, I remember discussions with Helmut Schwichtenberg about Tarski-Grothendieck set theory as the foundation of the formal mathematical language of Mizar. In 2010, I came again across the name of Alexander Grothendieck several times, when searching the web about my new hometown Bures-sur-Yvette, where I lived until August 2014 only a few hundred meters from the famous IHÉS institute. That was the place where Grothendieck worked for some time at the peak of his mathematical life (until 1970). Afterwards he removed himself more and more from public and scientific life. Winfried Scharlau has started to publish material about the life of Grothendieck some years ago, with this notable article from 2006/2008. There was also some activity on the web to collect more information, but this was stopped abruptly in 2010 with this angry letter from Grothendieck himself, speaking to the world from a secret place in the Pyrenees. At least we now know that his last residence was in Lasserre (l’Ariège); see also this article of La Depeche. Here is another blog with many more links. 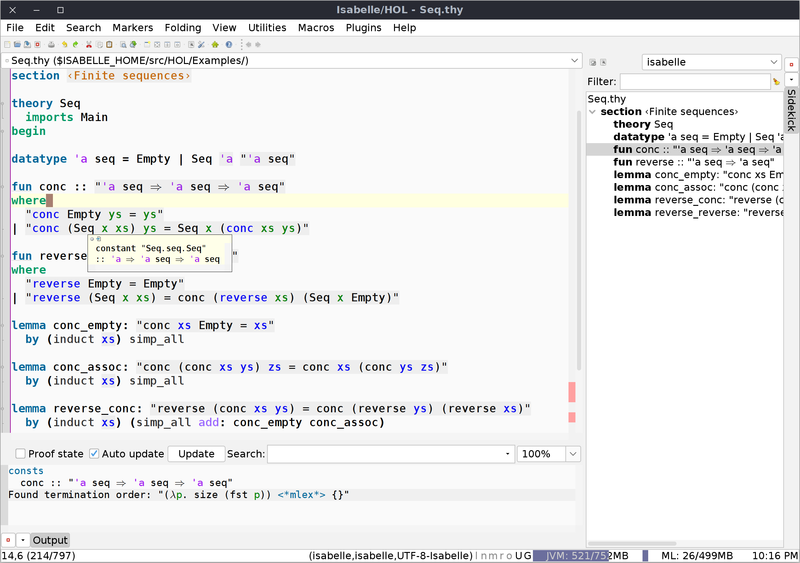 Strictly speaking the Isabelle environment is for interactive and automated theorem proving, but its SML IDE support is quite sophisticated: source files are statically checked and semantically evaluated while the user is editing. The annotated sources contain markup about inferred types, references to defining positions of items etc. As a quick start, see the Documentation panel, section Examples, entry src/Tools/SML/Examples.thy (as of Isabelle2014). The time where SML sources need to be edited with vi or emacs are over. See also this related thread on Stackoverflow. 31-Oct-2014 is the historic date (Reformation Day!) when support for Proof General was ultimately removed from the Isabelle code base. This is the relevant changeset. This means the current official release of Isabelle2014 (August 2014) is the last one where Proof General Emacs is still available as (optional) component; see the explanation in the published NEWS. After that its 15 years of history comes to an end, with the last 3 years an increasingly heavy burden and hindrance of further advances in Prover IDE technology (as represented by Isabelle/jEdit). The TTY loop for the Isar toplevel has been removed as well, see changeset. It might appear rather drastic to have an Interactive Theorem Prover without the classic read-eval-print loop, but we need to recall that TTY interaction stems from the 1970-ies. PIDE supports direct editing of theory documents as interactive sessions (or projects): this is more adequate for the interaction standards of the 1990-ies — a form of direct manipulation. It should be noted that the general PIDE protocol infrastructure is sufficiently flexibile to support old-fashioned stepping through proof scripts as well, maybe even with some Emacs front-end. So Proof General veterans who do care enough about that may assemble at the proofgeneral-devel mailing list to prove that this old warrior is not-quite-dead yet. On 29-Oct-2014, EPTCS has published the proceedings of UITP 2014, which was a workshop at VSL 2014, Vienna, July 2014. The volume includes my contribution System description: Isabelle/jEdit in 2014. The paper has been updated to the current official release Isabelle2014 (August 2014).